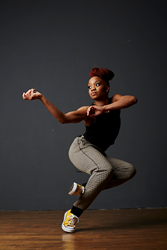 NDP begins 20th year of supporting new dance works in the U.S.
Camile Brown; photo: Whitney Browne. The New England Foundation for the Arts has awarded $1,637,900 through the National Dance Project (NDP) to support the creation of new dance works that will tour the United States. These dance works will be created by choreographers and companies with compelling artistic voices and at different stages in their career. Nineteen projects were selected out of 118 competitive applications by a panel of national dance leaders including artists and presenters who serve as advisors to the program. The projects will receive grants ranging from $20,000 to $44,000 for the creation of the new work, plus $10,000 in unrestricted general operating support for each artist recipient. A total of $665,000 will be awarded to U.S. nonprofit organizations that present these works when they are ready to tour. Over the past 20 years, NDP has invested more than $33 million in funding to artists and organizations to strengthen partnerships and bring dance into communities across the U.S. To date, NDP has supported the creation of over 370 new choreographic works that have toured to all 50 states, Washington, DC, and the U.S. Virgin Islands, reaching over 3.6 million audience members. NEFA's National Dance Project is generously supported with lead funding from the Doris Duke Charitable Foundation and the Andrew W. Mellon Foundation, with funding for special initiatives from the Cultural Services of the French Embassy, the French American Cultural Exchange, The Reva and David Logan Foundation, the John D. and Catherine T. MacArthur Foundation, and the Richard H. Driehaus Foundation. To learn more about the grantees and their projects, visit the directory of NDP projects with tour support available on http://www.nefa.org, look for the 2016 National Dance Project publication available in early September, or contact program manager Sara Nash at 617.951.0010 x512 or snash(at)nefa(dot)org. The New England Foundation for the Arts invests in the arts to enrich communities in New England and beyond. NEFA accomplishes this by granting funds to artists and cultural organizations; connecting them to each other and their audiences; and analyzing their economic contributions. NEFA serves as a regional partner for the National Endowment for the Arts, New England’s state arts agencies, and private foundations. Learn more at http://www.nefa.org.